I think that mixing static and dynamic content is a great idea. In the current version of VR Player, I decided not to allow loading multiple media files at once because I was afraid of performances issues but combining images with a video should not be a problem. This is some thing I will keep in mind when I will work on the layered video feature. The oculus rift head tracking is now working! And it works good. Just tested it with some video. I could not find a option, but do you think to implement movement into your player? asking because i would like to change the size of the movie-plane, it was like sitting in the front row in a cinema. You can move around by using the arrows keys and pageup/pagedown buttons. Also, you can use F1 to calibrate orientation and F2 to reset orientation+position. Space bar is for play/stop. The keys are predefined but in future version, I will implement key mapping for customization and the ability to use other devices like the xbox controller. AWESOME! I absolutely love this project! Keep it up! Thanks gravity360, I appreciate the feedback! Soon you could build you're own VR Theater! It would be nice but there is already a forum member who is working on it. You should check out his virtual cinema project. With VR Player, I am trying to focus on the movie immersion. The ultimate goal is to feel like being in the movie rather than being in an environment where you are watching a movie. This week I uploaded a video on youtube to demonstrate the Oculus integration with VR Player and I received very positive feedback. I am very grateful but this made me realized that I included a lot of features in VR Player that are not as intuitive as I thought.. Using videos for presenting use cases is the most efficient way I found yet to generate constructive feedback because users don't have to play with config, find content etc.. This is an awesome piece of software. It's looking better and better with every version. It allows me to view any format 3D movie on the Rift in a way that actually works. Thanks for your great work! Presets. You usually need to change quite a few settings to get the video working, but then there may be more similar videos. It could be handy if you could save collections of settings as a preset. Oh... read the documentation. Press F1 to reset. Tried the experimental surround sound. Well it sounds experimental alright. I have not been able to find what would the actual output have to be to play the limit size of the image in oculus, if I have the two 3d images 360 x 180 image for a single frame of the video) what would the size had to be? and also the size for each of the squares?, and what program you suggest I use to go from the ready frames to the movies that can be read by the VR player. thanks for any help you can provide and great program this is exactly what I was looking for. I am using 12 pixels per degree for a one-to-one pixel mapping between windows desktop and Rift DK virtual environment, in my GMsphere program. That 12 PPD was chosen to make the pixels look like you are viewing them at a great distance with the naked eye. More PPD looks like you are looking through high-magnification binoculars. Less PPD looks like the projection sphere is moving with you, instead of part of the external environment. That virtual "magnification" effect is caused by a small head movement causing a large number of pixels to fly across you FoV, just like when searching for a visual target through binoculars. For me, 12 PPD looked nice, but I only tested integer values. As a nice coincidence, typical 360-degree panorama images are stored as 4096x2048, which is nearly the same PPD (4096/360 = 11.4) as I determined experimentally (12). Of course, it is not necessary to actually record at such a high resolution (especially for video), because the resolution can be interpolated up to 4096 while mapping it into the VR environment. Scaling an image up or down does not affect how you perceive it in VR (other than its size). Even 1920-wide will wrap around you such that you need to turn your head to see the sides (unless it is scaled down). 1920-wide is nice for typical 1080p content to minimize visible letterboxing at the top or bottom though, which I determined by watching 1080p SBS 3D "Sintel" in my GMsphere "PixelBall" environment (using modified GMphere code compiled directly into mplayer source code, with head tracking). So, if you want your video to appear attached to the environment instead of your head, and to not appear to be viewed through binoculars, try using about 12 pixels per degree of angular resolution (scaled to fit with the Rift DK optimal 110-degree FoV). EDIT: I analyzed the code I borrowed from (Deskope) more thoroughly, and it looks like the PPD value may actually be pixels per TWO degrees, which means the best actual PPD in my experience may be about 6 (close to Michael Abrash's claim of 14 pixels per two degrees). Last edited by geekmaster on Sun Jul 28, 2013 12:11 am, edited 1 time in total. Thank you for you suggestions! Some items are already in my back log but I like when people ask for features because it helps me to adjust priorities. About the ratio of projections, I will add the cylinder height in the next release and maybe dome depth a bit later. I will not modify sphere and cube projections because I did not see medias supporting different ratios (Rectangular Cuboid and Ellipsoid)..
For the settings, currently, it's possible to save some settings in the xmp metadata of files but not the parameters in plugins panels. This issue is my top priority but I like the preset idea and I will look into it right after. Your video really made me laugh The example is too perfect. The surround sound feature is indeed experimental because I did not test with a lot of audio codecs. I mainly tested with AC3 and 2, 4 or 6 channels. The result you are experiencing is clearly a bitrate problem but it would help me if you can provide more details on the audio codec you are using + settings. after testing i have found the problem to be aac sound. here's some testing results with different files. or just tell people to buy a soundcard with dolby headphone support. I have not been able to find what would the actual output have to be to play the limit size of the image in oculus, if I have the two 3d images 360 x 180 image for a single frame of the video) what would the size had to be? If you want to use a spherical 360x180 video and would like high resolution, GeekMaster suggestion of 4096x2048 is an excellent choice. For stereo format, you have to combine both of your videos (left and right eye) in over/under format. This will create a 4096x4096 video! It works but this creates huge files and finding a good codec for compression at this resolution is hard..
For the current generation of Rift it's probably over kill but keep in mind that the consumer version will probably have higher resolution. Note: If possible, keep resolution size as a power of 2 because at higher resolution, it's been reported that you might experience memory issues. what program you suggest I use to go from the ready frames to the movies that can be read by the VR player. I know there are a couple of applications available but I prefer not to recommend a specific one because I don't have a lot of experiences with stitching software. I am curious and if you find a good one, you can share the information on this board! This software was recently released. Haven't tried it yet, but if you have an nvidia gpu it can accelerate the stitching. The h.265 codec is specified as using 10Mbps bandwidth (for 4K video), but you can compress tighter than that for lower bandwidth consumption and reduced storage space, at a reduction in quality that may be worthwhile for some applications. Also, there is rarely a need for your video content to exceed the 24FPS framerate used in movie theaters, as long as your head-tracked view of the projection surface is updated at 60Hz (or higher) framerate. This was discussed in great detail in my "PTZ Tweening" thread, and was used in my "pixelpi" program (a subset of GMsphere) released in my "Rift Pi" thread. Last edited by geekmaster on Tue May 07, 2013 8:30 pm, edited 1 time in total. Thank you both for the infos on audio and video codecs. This is helping me a lot. The stitching software got a nice list of features, I will check this out. Thank you. Soon, Ill be starting to shoot content for your player. I'm super excited about the possibilities. Ill be using this rig: http://freedom360.us/ which was mentioned in the previous posts. It can shoot at 5.7k, but I think a more ideal format for content will be 4k. Stitched, the video is 4000x2000. Looks incredible on your player with the rift! The video itself plays back fine on my system (i5 4.2ghz, ati 6870), though the rift tracking is a bit laggy. Do you think this is due to the high resolution of the video? Also, when i size the window to be almost full screen, there are no playback issues, but when i hit full screen the frame rate drops by about half. Although Ill be working with a sphere of video, is there any way to set the player to load the video so that it faces in a direction I want it to for the viewer? ie, a video of a car chase, and I want the video to load so that the 'looking forward' view is oriented out of the passenger window...or in that example video, lets say I want the viewer to be 'looking forward' at the hang glider guy and not the horizon. Ideally I want to set this for the viewer this will be highly useful in guiding the viewer to look 'more or less' at what I want them to look at. Perhaps instead of having lots of options for which unwrapper, sphere slices, etc..we can just base that around which camera the footage was shot with and imbed that info in the video file itself or in an accompanying txt so that its always playing back the 'best' rather than having to tweak for each clip? Will this be workable via your plugins perhaps? Finally, for future versions, it would be really sweet to be able to control playback with the rift itself. The Proton Pulse demo has a very simple implementation of selecting stuff, but its highly intuitive and works well. In a perfect world, I want to be able to select videos, pause, stop, play etc without having to take the rift off. I was thinking, if you tilt your head and look at the ground for a second or so, a menu could fade in and give you those options? Users would likely never be looking at the ground for long anyways. or perhaps head gestures like nodding or shaking your head to move forward or back in the menus? I realize this may be a challenge. Ill be donating to your project soon...this is great stuff!! It can shoot at 5.7k, but I think a more ideal format for content will be 4k. Stitched, the video is 4000x2000. Hmm... The 360-stereoscopic image sets I have been working with are 4096x2048 (or other power-of-two sizes), which makes processing them a lot simpler. Using decimal-based sizes is not efficient for a binary-based computer (especially when working with lower-power hardware like the Raspberry Pi or Ouya, both of which I plan to support). Your 4000x2000 resolution does not match any of the common standards for 360-images or for 4K video. Are you sure about the missing 96 rows and 48 columns of pixels in your "4K" stitched video? IMHO, it would be MUCH better to use one of the existing 4K standards rather than creating a new NONSTANDARD (decimal-based) 4K resolution. Few things in the computer world use resolution dimensions based on the human decimal number system. Looks incredible on your player with the rift! The video itself plays back fine on my system (i5 4.2ghz, ati 6870), though the rift tracking is a bit laggy. Do you think this is due to the high resolution of the video? The resolution may slowdown the system and impact the tracking but the real issue is in the implementation. Technically, I am using a timer to poll tracking data each x milliseconds but in the current implementation, the polling has a low priority. This imply that the player tend to skip polling too often, especially when the system is busy. I will release a quick fix soon. Also, when i size the window to be almost full screen, there are no playback issues, but when i hit full screen the frame rate drops by about half. What is the resolution of your screen? Did you change projection settings (Ex: Increased the number of slices/stacks of a sphere)? GeekMaster is correct about the resolution of the video, this may cause problems. I will try to produce a quick you tube video tutorial about this functionality. Thank you for the suggestion, this will be added in the metadata! I want to be able to select videos, pause, stop, play etc without having to take the rift off. I was thinking, if you tilt your head and look at the ground for a second or so, a menu could fade in and give you those options? I am currently refactoring the application's code to stabilize and improve the performances but UI improvement should be one of the next logical step! This is some thing I like to do and there is so many thing I want to experiment! If you have other questions/comments, do not hesitate. Actually, I was incorrect...when I said 4k, I suppose I meant 'somewhere around 4k' hahah. The resolution of my example shot is 4048x2024. Does that make a difference versus the resolution you've been working at? Great reply. I'll keep playing with it and fire over any other ideas that come to mind! It does not really make a difference, because I need to sample my input images at whatever input resolution I have available. I just thought that we do not need yet another "standard" 4K resolution. More settings will be added in next versions. Thanks Stephane I will give this a try! Thank you guys for your reply i will let you know how it goes with building my 360 3D camera. then somewhere else that oculus rift distance between lenses was 64 mm. does anybody know what the optimal distance between the centre of the lenses should be? When both cameras are pointing the same direction, you use the IPD of the lens center. But when fisheye camera viewing angles diverge you need to use a portion of your image pair from a pair of the cameras, where the left image comes from the right half of the left camera, and the right image comes from the left half of the right camera. So in this case, the lens centers will be farther apart than the viewer IPD. Perhaps 70mm lens center distance is correct for a 64mm viewer IPD, but it depends on the lenses and camera settings as well. Last edited by geekmaster on Sun May 12, 2013 4:58 pm, edited 1 time in total. In this release I took the time to refactor the plugins system (something I wanted to do for a long time). For most users, there is no impact on the software beside the folder structure. For developer, this will gives the tools to integrate custom tracking devices, try new type of projections matching specific capture devices and add special effects. For non-developer, I created a new projection plugin that allow file import from Maya and 3ds (Including geometry and UV mapping). Since the last release, I have experimented with a lot with positional tracking. I added a TrackIR plugin and I received help to correct Razer Hydra jitter problems by applying a smoothing filter. Positional tracking add an interesting dimension and feel more natural when watching a video on a virtual screen but for spherical/dome videos, this cause deformation so in these cases, it's better not to move the head too much. Tracking performances are a little better but there is still plenty of room for improvement. This is something I take seriously and I will continue invest time and efforts. Currently, my backlog is getting bigger and bigger. I received a lot of great ideas and I appreciate it! Finally, I hope to see more immersive content soon! Not only sport and music events but also short films including storytelling.. It's true that stereoscopic spherical movies are complicated to produce but there are good alternatives available now. Stereoscopic video projected on a dome are very immersive and accessible with cameras like dual go pros. Normal spherical videos are also a lot of fun to watch with the Rift. On a related topic; I got this idea and I was wondering... many viewers have complained about shaking and head movement in my POV videos. VirtualDub has this plugin called Deshaker, which can analyze shake and motion in video, and then compensate for it. The user first runs a video analysis pass, which produces a vector data file (motion vectors per frame). The user can then choose to re-encode the video with different anti-shaking options. But this usually applies a quite heavy crop to the video. Would it be a far fetched idea to read this vector file into VRPlayer, and make it compensate for the shaking in real time? You could see the virtual screen waggle around, but the picture would be more still. The viewer could follow the screen at their own pace, rather than being constantly shaken around by the camera man's whims. Could this work? Or would it take the viewer just closer to the Uncanny Valley of Nausea? The Voodoo Camera Tracker could be another interesting option - it would do it in 3D. But this means the viewers would have to run after the virtual screen. Would it be a far fetched idea to read this vector file into VRPlayer, and make it compensate for the shaking in real time? I actually mentioned this to StephaneLX in a PM xD Though I was mostly daydreaming hehe. This is some thing I wanted to try because one of the firsts experiments I made with the player was on a stationary bike, watching a mountain biking video and it was very shaky. I talk about the idea with video professionals and they said it was possible to stabilize the video source instead and get acceptable results so I did not invested more time on the feature. It's still in my back log and it would be easy to move the camera based on a stream of data synced with the video. 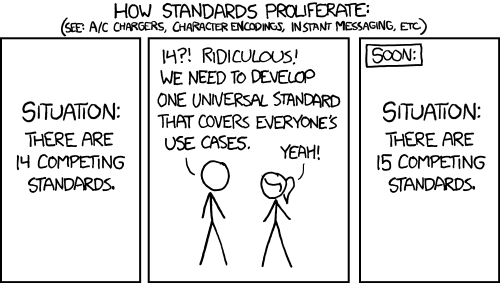 The complicated part is to find/create a standard way to do it. If go pro cameras had an accelerometer and was embedding data in metadata or a sidecar file, it would be perfect. Anyhow, the feature is on hold util I receive more demands. I was thinking about processing raw data from a sensor in a camera for stabilizing position and also orientation but I did not thought about using the output files from a stabilization software. I really like the idea. If you have a sample movie the associated data file including a list of vectors with maybe time stamps and optionally quaternions for orientation, I can try to implement the camera movement during video playback. I have always used the Deshaker plugin in VDub to create a larger image, filling in the edges with content from past and future frames. Even when I had that off, I still used a bigger output frame size, and my input rectangle just rotated and moved around inside that. It would only crop in extreme cases where the input frame momentarily jumped partly off the output frame. Now, regarding reusing the motion vectors from Deshaker, I absolutely LOVE that idea! I am very impressed! I really enjoy discovering simple ideas that I have not already considered myself at some point in the past. Thank you VERY much for sharing this new (to me) idea! It is the norm to find "new" ideas presented here that I read about long ago (and sometimes can find again with Google). But this one really is new to me, and I *LOVE* learning new things whenever I can. My new daydreaming is to connect an IMU to an Arduino and output the tracking data as audio to one of the cameras. Do you want to generate audio similar to what a Theremin produce? What will be the visual output in the camera? The thought would be to save stabilization data from the IMU as an audio-signal in one of the video-feeds in a stereo camera setup where both cameras can record stereo audio. I realized I'm not a sound engineer and have no idea if it is possible to extract enough different frequencies from two channels to actually store enough data for it to make sense And compression in the camera might ruin it anyway. The idea probably comes from various iPhone accessories which communicates through the audio port. It would automatically be synced with the video though, which would be nice. With the cameras on fixed on a baseline at least one of the cameras will always have translation which would have to be taken into consideration when moving the views in the player No? My brain is melting now and I need to get back to work, heh! All right! I'll whip up a video file. I don't know if Deshaker can properly analyze side-by-side video, but I'm hoping that single video (left only) will be enough. also, I don't know how Deshaker behaves with text (especially if it's scrolling), so I'll make the test data with a single take/cut from my "Norrtull flea market" video. StephaneLX, if you send me your email address in a private message, I'll deliver the files to you when I'm done. I'll send the side by side 3D video (with full soundtrack), the left only video (with rough action cam audio) and the Deshaker log file. The Deshaker data is in text format, so it should be parseable. I'm not sure how to deal with the fisheye distortion. The action camera footage is fisheye warped, which matches fairly well with the Rift - but since the virtual screen is now going to move around to compensate for shaking, maybe the video should be de-fished (to rectilinear) and the fisheye warp applied in post? ... I'm not sure how to deal with the fisheye distortion. The action camera footage is fisheye warped, which matches fairly well with the Rift - but since the virtual screen is now going to move around to compensate for shaking, maybe the video should be de-fished (to rectilinear) and the fisheye warp applied in post? I believe VDub has crop and stretch filters built in. And yes, you need to de-fisheye to deshake unwanted camera motion, then re-fisheye the result. To use the fisheye filters, you need to split the video into left and right videos, defisheye both of them, join them SBS, deshake them, split them again, fisheye them, and rejoin them. Deshaking them independently will cause arbitrary vertical misalignment at times, so they need to be done joined SBS. Defisheye and fisheye use the same filter, just with different coefficients (i.e. adjust slider between degree of barrel or pinchushion required). I used deshaker on a lot of my videos about 7 or 8 years ago for video filmed in moving vehicles. But I prefer the deshaker mode that fills in the edges with pixels from past and future frames, instead of a moving black border frame. I often used VDub filters in AVISynth for larger projects with more operations, because it is scriptable and allows you to batch a lot more stuff together, and provides additional features not in VDub. For the steps described above, I would probably use AVISynth with Deshaker, instead of VDub. I also used another great tool back then that inserted motion-vector based interpolation frames (where the key frames were supplied by the original video). It did a wonderful job of creating a higher framerate, or of converting a video to extreme slow-motion (up to 10x) with no visible artifacts. I cannot remember what it was called, nor can I find it again, but it was a wonderful tool (free for non-commercial use). Hint: You can crop (including cropping a single SBS half) with the Cropping button in filter select. If not using other filters, select the Null Transform filter.